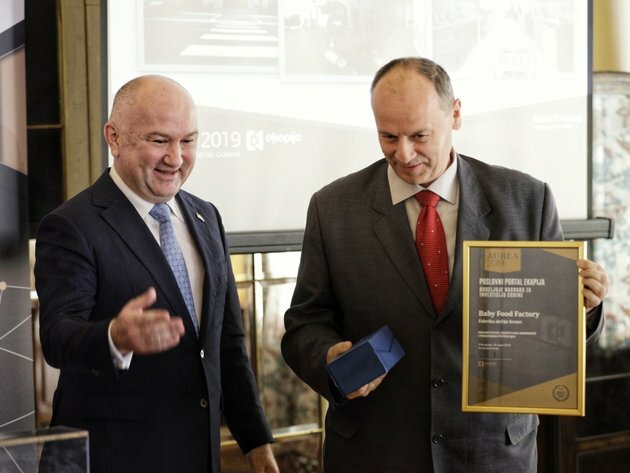 The Belgrade-based company Baby Food Factory has won the Aurea 2019 Investment of the Year Award, given out by the business portal eKapija for the 11th year in a row. The award was handed out to the laureate at the official ceremony at Aeroklub Belgrade by the minister for innovations and technological development at the Government of Serbia, Nenad Popovic. On this occasion, he pointed to the importance of the development of the IT sector, as it was the IT industry that recorded higher exports than Fiat and Smederevska Zelezara for the first time in 2018. – This is the export of Serbian knowledge, as engineers are the carriers of innovations in Serbia. South of Munich and Vienna, Serbia has the best engineers, and we must do everything to have as many as possible and to have more than 51% students enroll at technical faculties in Serbia – Minister Popovic pointed out. Popovic gave special acknowledgment to faculties of technical sciences in Serbia, pointing out that it is in technical sciences that the future lies for all children in Serbia. Handing out the award to Baby Food Factory, he pointed out that each company that was nominated deserved to get Aurea 2019. Baby Food Factory opened in October 2018 in Dobanovci. The mission of the team behind this investment was to offer healthy, high quality food for children. This is a greenfield investment worth EUR 34 million. – The Investment of the Year Award is a special kind of acknowledgment for our company and the proof that Baby Food Factory has been recognized as a project which helps to bring the local baby food industry back to the place it deserves, but also to improve the exporting potentials in this segment. This investment is truly an important step forward in the domestic baby food market, as we’ve brought new production standards and offered our consumers high quality, healthy baby food. Our products are already making their way through the markets of the region and the Commonwealth of Independent States, and keeping in mind that only the first phase of the investments is completed, we are looking at additional investments in the years to come, as well as the expansion of our range of products and the penetration of new markets. We are especially proud of the fact that this is a local investment, thanks to which our country now has a modern factory which can stand shoulder to shoulder with big world producers, offering top quality to parents and children – said Zeljko Ciganovic, the CEO of Baby Food Factory. In addition to the main award, eKapija has also given out two special acknowledgments. The innovation award went to Alfa Kima from Knjazevac for its innovative design of heat pumps featuring the R290 gas, under the protected name of PropSafe. This award was handed out by Vladislav Lalic, Country Manager at IKEA. – It is my special pleasure to hand out the innovation award today, because innovations are immeasurably important in the world we live and work in. As Canadian Prime Minister said in Davos in 2018: “the pace of change has never been this fast, yet it will never be this slow again” – Lalic pointed out. The social usefulness award went to the BioSense Institute in Novi Sad for the development of the first Digital Farm in Serbia and to Delta Holding for their Nase Selo project. – Social usefulness is not just philanthropy, but a much wider concept. It is perhaps one of the most important categories, something that needs to be talked and written about much more, as companies learn from each other that way – pointed out Mihailo Vesovic, adviser to the president of the Chamber of Commerce of Serbia, who handed out the social usefulness award. The president of this year’s jury was Vojin Senk, a professor at the Faculty of Technical Sciences in Novi Sad, who emphasized the importance of such awards. Professor Senk invited companies to apply for awards and projects such as Aurea, but also the media to write about innovations as much as possible, as they will thereby incite good projects and ideas, but also motivate young people to stay in Serbia. Other shortlisted projects this year include: Swan – Compact scanner for digitalization of archival materials; Ott System – Natural ergonomic sleeping system; Daktilograf Engine – Speech-to-text platform; and VOZZi – Mobile road help app. – We are extremely satisfied with the quality of this year’s candidates for our company’s award. In today’s world, only the best business endeavors, the best concepts, can survive. Good ideas, however, are not worth much without the ability to have them realized. We believe in the Aurea candidates. We believe that all the nominees have a chance of achieving considerable success and that our laureates are the first among the equally good – said Mirko Radonjic, the editor-in-chief of eKapija. The winner of the main Aurea 2019 award and the recipients of the special acknowledgments were picked by a six-member jury, and the readers of ekapija.com and aurea.rs also voted. The requirements were that the projects had been realized in the previous calendar year, meeting three criteria: innovation, social usefulness and financial potential. The partner of eKapija at the Aurea 2019 award ceremony is Global IT Factory. The Aurea 2019 award ceremony at Aeroklub Belgrade was attended by numerous representatives of the diplomatic corps, the business community and the media. The business portal eKapija hands out Aurea awards as part of its orientation towards socially responsible business, without a financial interest, intending to promote and support projects important to a sustainable development of the Serbian economy. The direct benefit for the winners, but also all the investments shortlisted for the award, is promotion, which further materializes through increased visibility with investors, easier communication with the media, banks, public administration and other potential partners. Since 2009, eKapija’s initiative of supporting projects benefiting the sustainable development of the Serbian economy has resulted in a wide media promotion of around 80 innovative companies and individuals. Baby Food Factory started operating in October 2018. The factory, which features the most modern facilities, produces a full range of baby foods, consisting of dry grain meals, liquid grain meals, juices, purees in a glass packaging, but also in the new soft “pouch” packaging, under their own Nutrino brand. From the very beginning, they set high production standards for themselves at the factory, opting for a responsible approach when it comes to food quality and safety. In each part of the production process, they pay special attention to the healthiness of the products in line with international standards. The entire production space, the laboratory and the logistics passageways of the factory comply with the standards of the so-called “clean room panels”. These standards entail a full absence of anything unclean, matching conditions that can be found in operating rooms and pharmaceutical facilities. Keeping in mind that clean room panels are neither the standard nor the practice across the baby food production business, but a choice of the team behind Baby Food Factory, it’s clear that the care for a healthy growing up of children is deeply ingrained in the philosophy of baby food production which the company wants to establish in the local market. The daily production capacity is 50 tons of tasty and healthy baby food, which will be available in the local and the regional markets (Serbia, Montenegro, Bosnia and Herzegovina, Macedonia, Albania, Kosovo, Croatia and Slovenia), but also in the markets of Southeast Europe and the CIS (Azerbaijan, Belarus, Armenia, Kazakhstan, Kyrgyzstan, Moldova, Russia, Tajikistan and Uzbekistan). The factory takes up 33,500 m2, of which 13,600 m2 are indoor facilities. The investment is worth EUR 34 million, which makes Baby Food Factory one of the biggest investments in Serbia, but also the largest local investment in 2018.